1.Automaticlly fold the top panels ,stable and smooth ,beautiful look an save the labour,can be used with the Automatic Packaging Machine Series.The lastest patent tape attaching device,no need the fan to blow the tape to make it smooth ,apply the patent pressing device,ensure the tape tightened avoide the ineffective taping. 2.high precision ,low noise ,longer the life of the belt. 3.It is able to do auto folding for top lid. 4. Adjust the width and the height manually according to the carton size. 5.Imported of components Electric and pneumatic parts. Looking for ideal Sealing and Packaging Machine Manufacturer & supplier ? We have a wide selection at great prices to help you get creative. 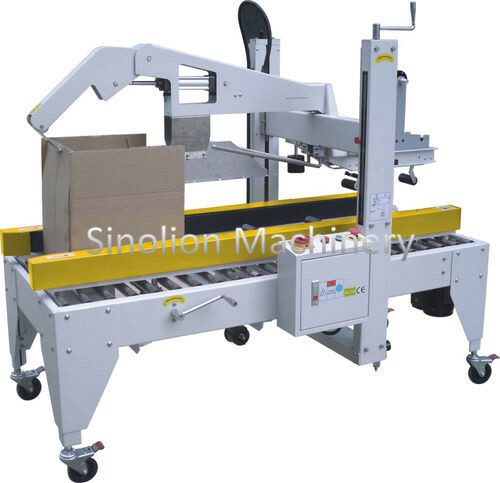 All the Carton Packaging Machine are quality guaranteed. We are China Origin Factory of Paper Box Packaging Machine. If you have any question, please feel free to contact us.